The 1964 Toploader used a narrow maincase with 4 bellhousing bolt holes and small O.D. bearing retainer. All 1965-73 cases use a wider flanged case with 8 bellhousing bolt holes and the large O.D. bearing retainer. The bolt patterns on the retainers are all the same but what is most important is the diameter of the base that fits into the bellhousing. Order 4-11/16" for 1964 bellhousing and 4-7/8" for 1965-73 factory bellhousings and afternarket scattershields. 1-1/16" Input shaft bearing retainer with new seal and gasket included. Order 4-11/16" for 1964 bellhousing and 4-7/8" for 1965-73 factory bellhousings and afternarket scattershields. 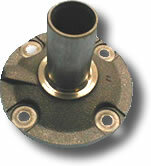 1-3/8" Input shaft bearing retainer with new seal and gasket included. 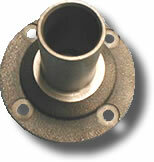 Order 4-11/16" for 1964 bellhousing and 4-7/8" for 1965-73 factory bellhousings and afternarket scattershields.